Happy Friday, Ladies! I’m super excited about today’s post! This is my 4th monthly Amazon Fashion Haul (click HERE to see the first 3), and this one is reallllllllllllly good. Like stupid good. I am SO EXCITED about so many of the items in today’s post. 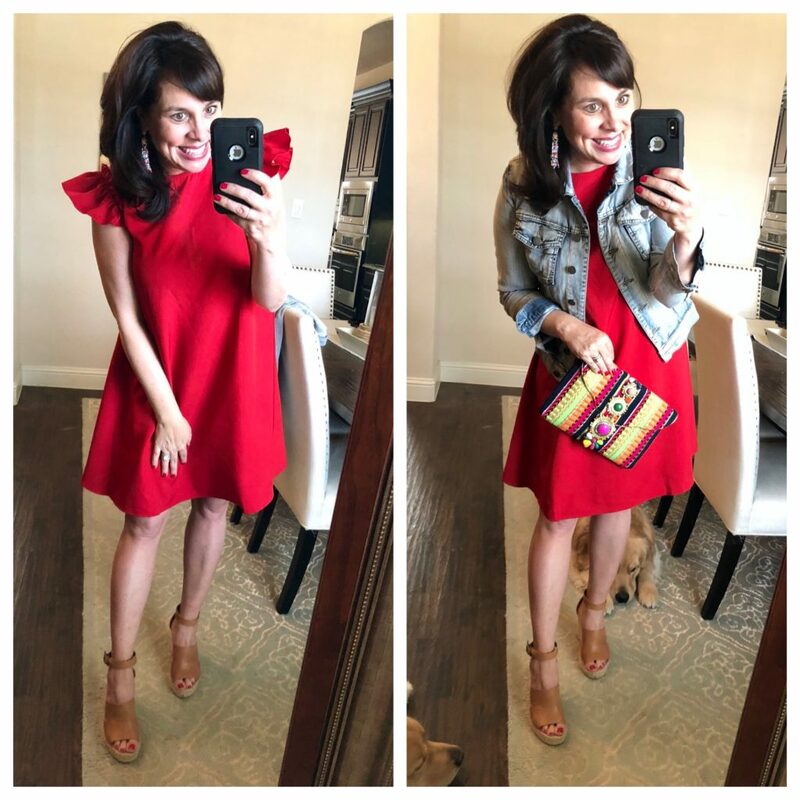 I’m thrilled that y’all are loving the posts (they are three of the most viewed posts over the last 12 months), and I’m having so much fun learning how to shop Amazon for clothes. I continue to return about 1/2 of my order each month, but I’m starting to figure out how to use the search function better and I’m finding brands that I love and go back to each month. If you are new here, I recommend clicking HERE to scroll through my other 3 Amazon posts. 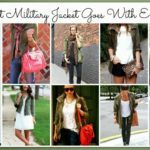 Lots of great stuff including an awesome t shirt dress, a great military jacket, and a super soft open front cardi that I wear at least twice a week (all in last month’s post)! LET’S GET STARTED WITH THIS MONTH’S FINDS! When I started seeing everybody in blogger land talking about these blue light glasses , I thought this is my chance! I can finally rock some glasses! I’ve only had them for a week, so I don’t have a very comprehensive review, but they do seem to be helping me reduce my tired eyes headaches. So, my verdict: CUTE AND HELPFUL! And go ahead and get excited about the other items in this pic. The sweater, the earrings, and bracelets are all going to be featured on Monday’s post. My lipstick is “fashion icon” and can be found HERE. As you can see on my lips, it’s not nearly as dark as the color appears online. I’m really excited about these next 2 tops. I ran out of daylight and didn’t have time to photograph them on me, but I’ll make sure I show them on me next week. Now, listen ladies. They aren’t cheap, but they are GORGEOUS. They are outfit makers. I ordered a small, but the darts pull a little bit, so I need to size up to a medium. If you aren’t large chested (and kind of broad chested like me), you can for sure stick to your regular size. The small didn’t feel small on me, but the darts just didn’t lay flat. I love how it’s embroidered across the top and on the sleeves. And the sleeves and the neckline are finished off nicely with some tiny little ric rac. Update: The pink is now running low on stock, but you can find a beautiful white and blue option HERE and a white and multicolor option HERE. This one is a total show stopper. The colors are vibrant, and the embroidery work is absolutely stunning. I’ll for sure be wearing this off the shoulder, but the description says you can wear it strapless as well! (For those of you that are new here, THIS STRAPLESS BRA is the be all end all. I wear it even when I don’t have to wear a strapless.) I got a small in the top. If you are really long waisted, this one might not work for you. Okay, we’re done with the show stoppers for now. Now I’m going to talk about some basics that I know I will reach for again and again. 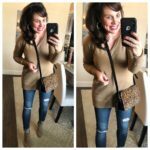 This tunic tee is soft (a luxe jersey! 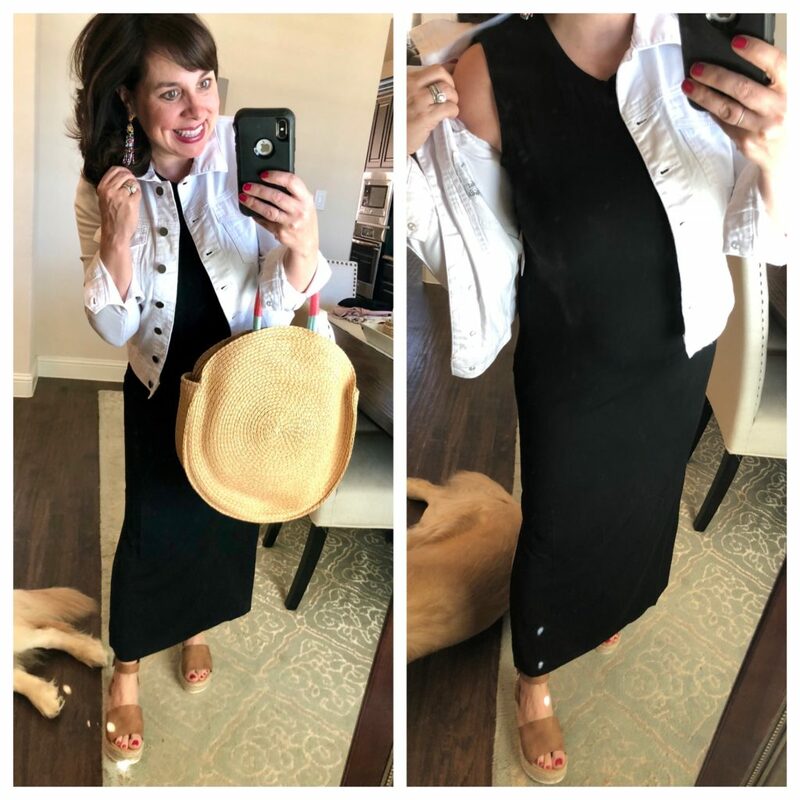 ), very forgiving, hides a mid-section well (not that any of us have one that needs to be hidden #winkwink), and is definitely long enough to be worn with leggings if you desire and it definitely covers the hiney. It’s not clingy at all, and although it’s large, it drapes nicely. I really like the longer drop sleeves and how the pattern reverses on the cuff. I’m wearing a small, but I might have even been able to go with the x-small. I went with the stripes (because STRIPES), but it comes in several solids as well. AND Y’ALL. It’s ONLY $14!!! This tee is from Daily Ritual, and it’s one of the Amazon brands that I’ve definitely come to trust. So far, everything I’ve ordered from this brand has been top notch quality! Did you notice the darling jeans above? Let’s talk about them. When I partnered up with Kut from the Kloth for our brand ambassadorship, we discussed how there was going to be a new item that I would be highlighting each week. But I made it perfectly clear that if I didn’t love an item, I would just repeat another item, and they were fine with that! When I made that statement, it was these jeans I was thinking of. When looking at the picture, I didn’t think I was going to like them. I was wrong. And I don’t just like them, I love them! I mean, they are a bit of a throw back to my junior high days, but I absolutely love the fit. They don’t sag at all and they are a higher rise (but not too high). I feel like although they are a throwback, the button fly actually makes them cool and modern! There is no distressing, and the raw hem is subtle. I’m wearing my regular size 4s, so I think they are true to size. There’s only 1 review online of these so far, but the title of that 1 review is “Feels like butter, Fit like a dream.” I couldn’t agree more. I’ve had this hooded tunic tee for a week now, and I’ve already worn it twice. It’s that good. I already know that it’s going to be one of those tops that I reach for weekly. It’s just so easy to throw on and look put together with no effort. It’s also from the Daily Ritual line. Mine is the “blue heather”, but it comes in several other solids as well. The fit is perfectly slouchy, and the hood and ties make it extra cute! As you can see, I’ll be wearing it casually with both jeans and shorts. I’m wearing a small, so it’s true to size. 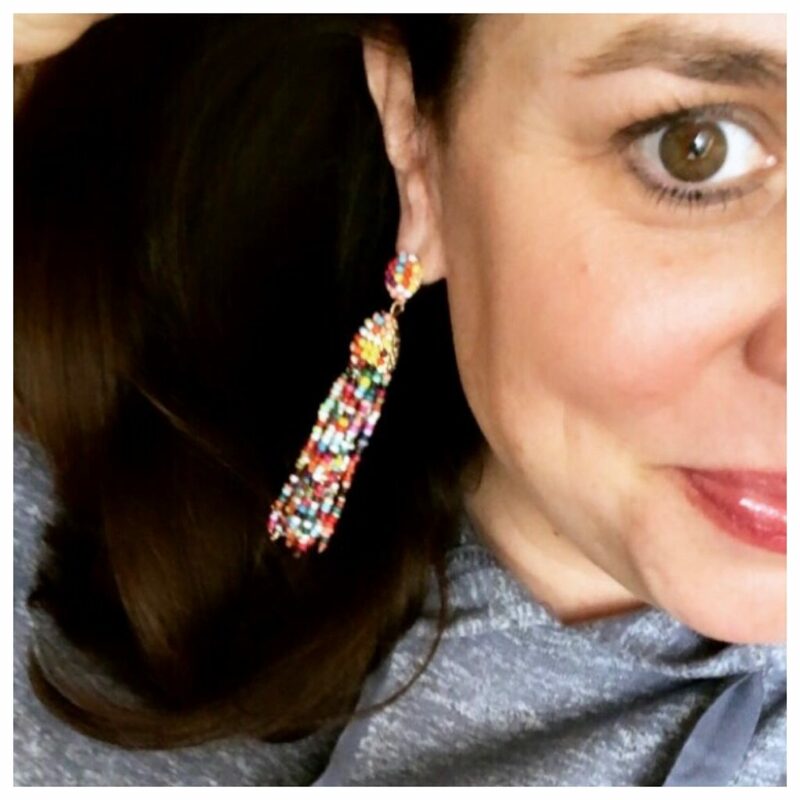 I love these multicolor beaded tassel earrings. They come in lots of solid colors, but my favorites are these multicolor and the coral ombre! So pretty, and they are all under $10! Because I don’t travel a lot, I wouldn’t have thought of this, but some reviewers mentioned that they are great for travel because they are so lightweight and pack very easily. Also great for travel, these low profile wedges. They are comfy, true to size, a little bit sporty looking, and UNDER $40! They come in tons of color choices, including a snake skin and a fabulous leopard! 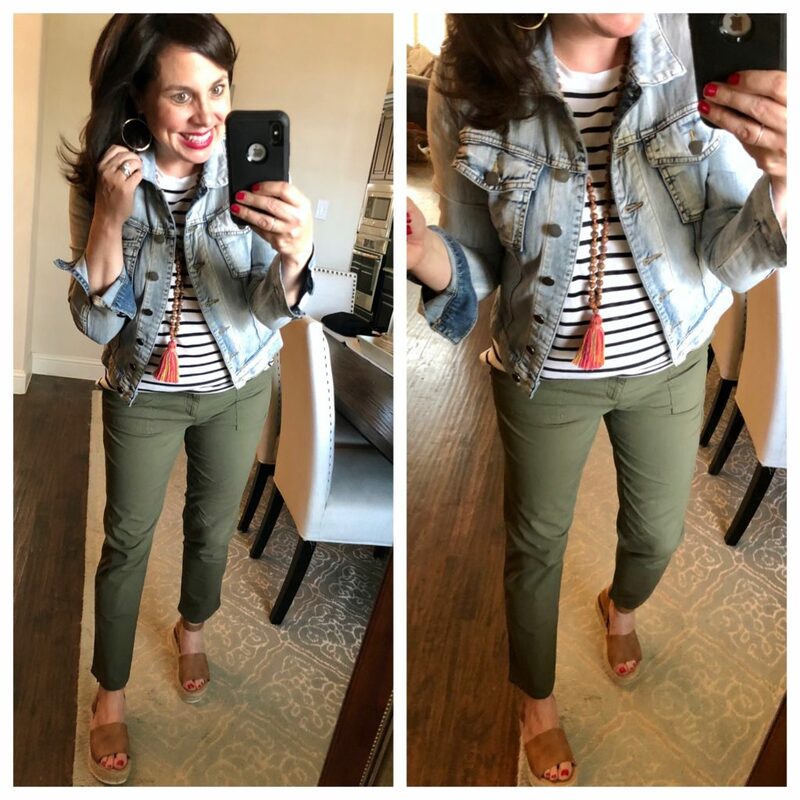 I threw on my favorite spring and summer necklace and must have denim jacket for a super cute look! Here’s an overhead shot I grabbed at the ranch this past weekend. I might have worn this exact outfit 2 days in a row AND slept in it. Okay, I did. 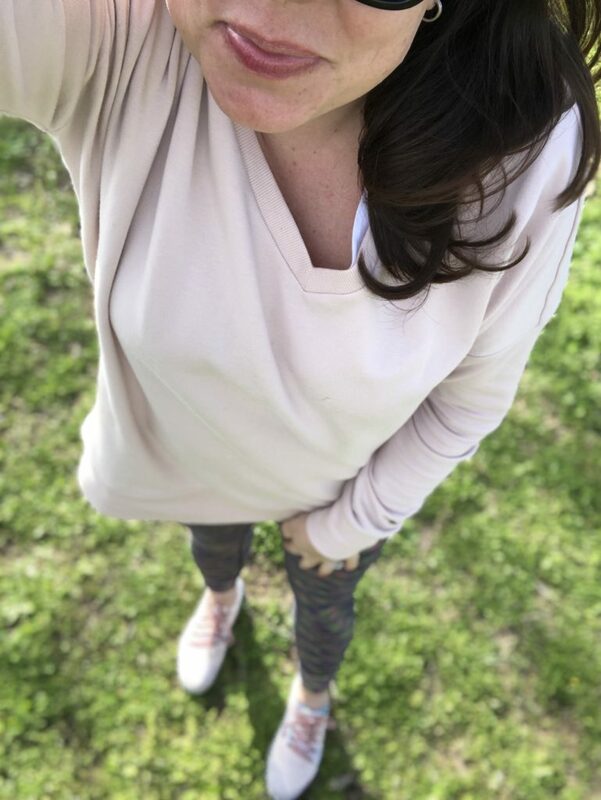 This tunic sweatshirt is incredibly soft and super comfy. I bought the medium to make sure it would be long and loose enough to wear with leggings, and it totally is. If you aren’t going to wear it with leggings, just stick with your regular size. I also love the heathered grey and the tiny stripe. 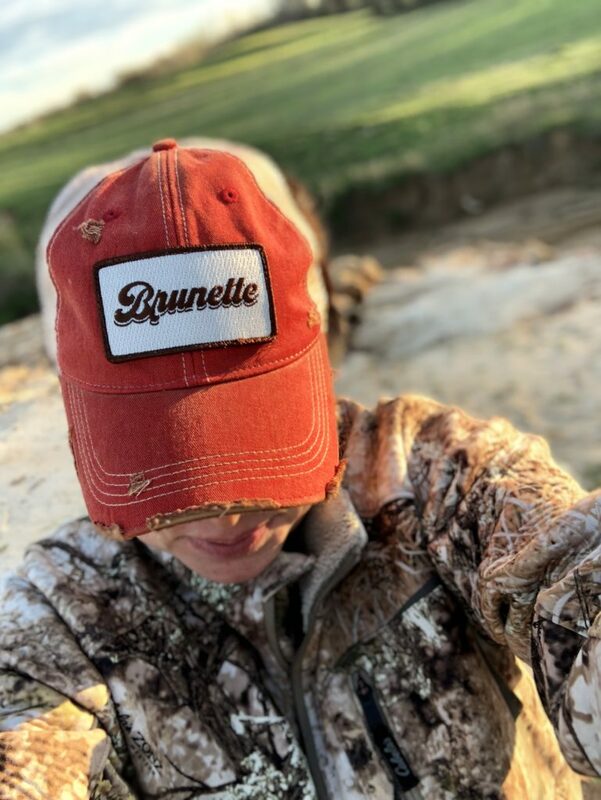 You saw this cap styled in my last Amazon post with real outfits, but you better believe I busted it out at the ranch with my Day 3 hair and Chris’s camo jacket. So when scrolling Amazon, I somehow stumbled upon this flutter sleeve dress. When I saw the fantastic reviews and the low LOW Price (UNDER $22! ), I knew I wanted to give it a try. I almost ordered the black, because it’s my safe place….but I thought the red was darling. The flutter sleeves are a little aggressive, but I actually like them. It’s not see through, and it’s a medium weight fabric. If you go check it out online and scroll down to the reviews, you can see it on lots of different people of different sizes and shapes (and in several different colors)! I sized up to a medium, and I definitely needed it in the bust and for the length. I’m only 5’4″, so if you are really tall, this dress probably won’t work for you. And let me say it again. It’s UNDER $22!!! I wanted to show it styled with a jacket and clutch too! Okay, ladies. This is totally and completely out of my comfort zone, but I went for it. And I kinda love it. It’s incredibly comfy, I love the pockets, and I think it’s fun that it’s different than anything I would usually wear. 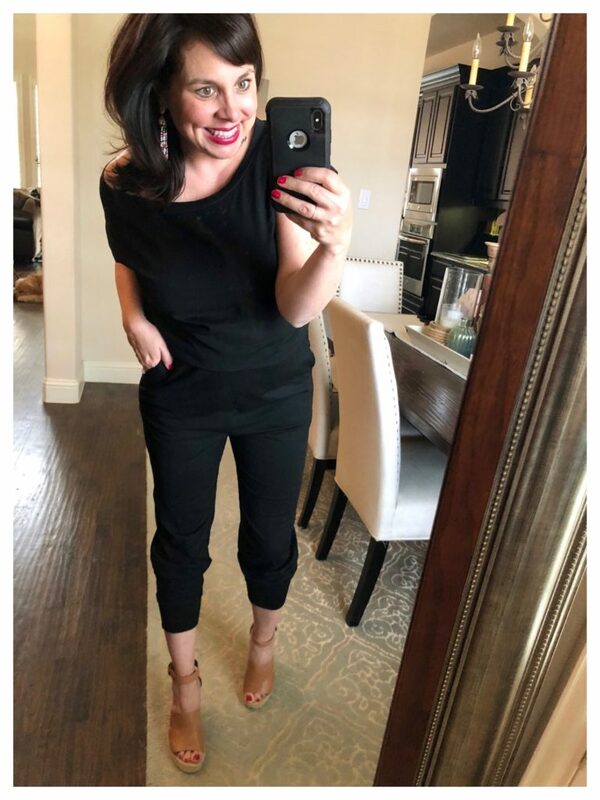 I have it sassed up here with wedges and tassel earrings…but I also think it would be cute to just wear as lounge wear with flip flops! It would actually probably be cuter that way. I’m wearing a small, and it’s definitely fitted. 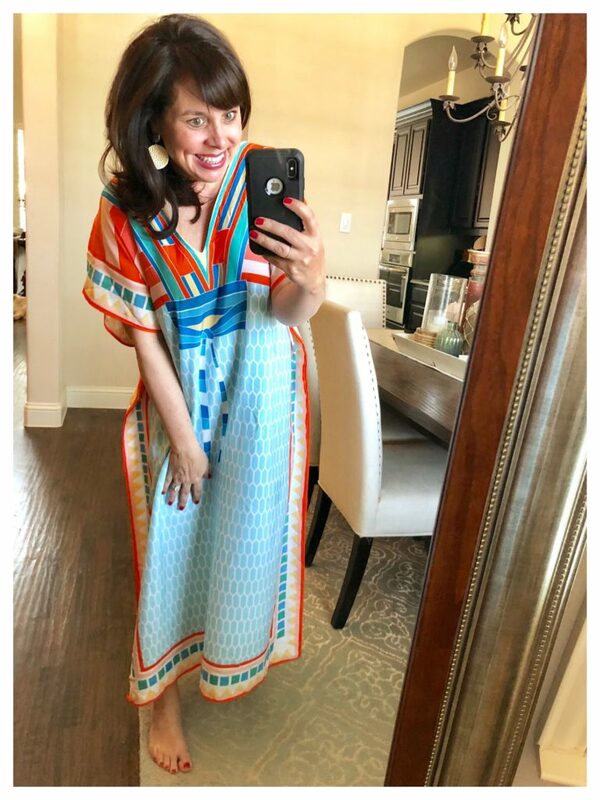 You might want to consider sizing up if you’d like it a little bit baggier…especially if you are planning on wearing it as lounge wear. 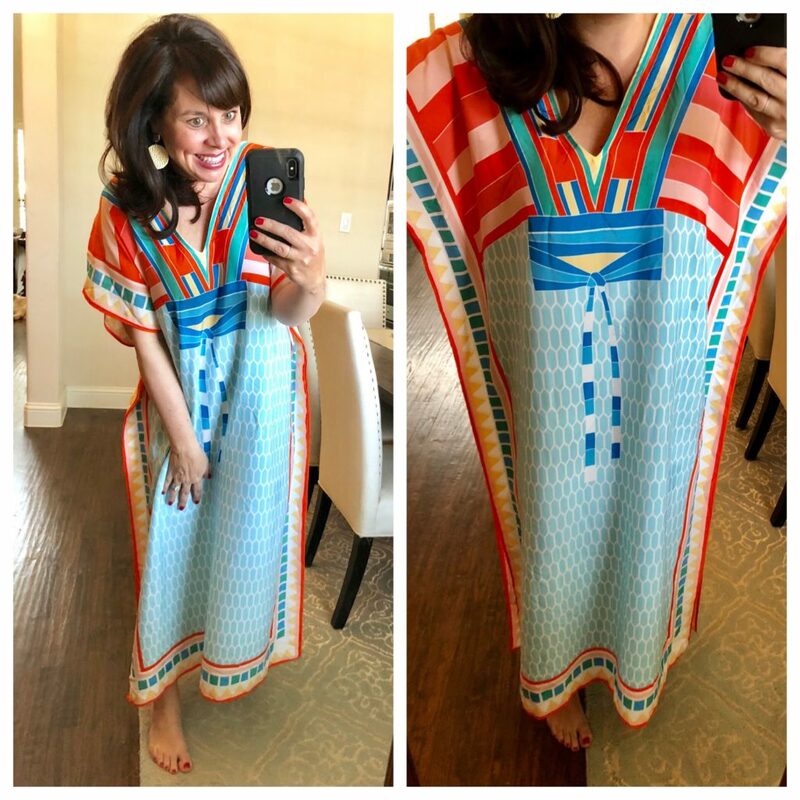 This is also UNDER $22, and if you want to see it in other colors and on other body types, just click HERE and scroll down. I’m going to need to have your undivided attention for this next item. I love it so much. I mean. THIS is a cover up. Do you have a romantic vacation planned anytime soon? Get this cover up. Or maybe you just want to look totally fabulous at the local pool? Get this cover up. There are sooooooo many different cover up choices under this one link, and lots of them look pretty great! But I love this one, and it’s called “orange/blue”. When I click over, it’s the 3rd row down, 2nd from the left. And there seems to be a theme developing here, because it’s UNDER $22. I seriously feel like it looks like a $200 cover up from Shopbop! It’s one size fits all, and it’s all sorts of billowy. And I know I mentioned this before, but it’s fabulous too. The rattan and gold earrings are awesome too. 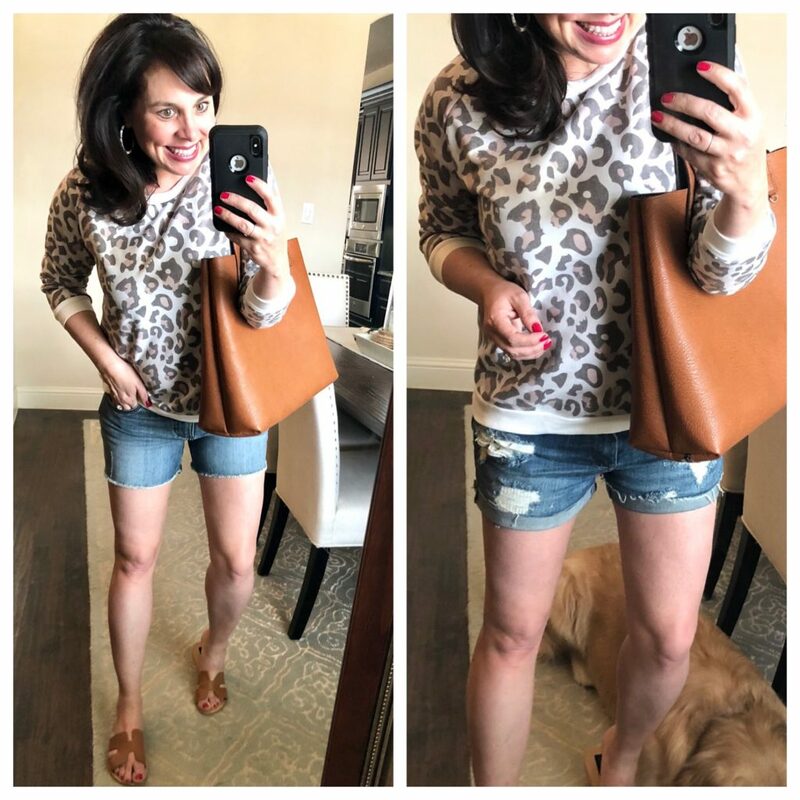 I’ve seen this leopard sweatshirt on lots of bloggers, so I had to try it for myself. It’s fine. I mean, it really is fine. But I don’t love it. It’s not super soft, and I prefer super soft. I do however like it enough to keep it I think. I’m wearing a small. And you guess it, it’s under $22. 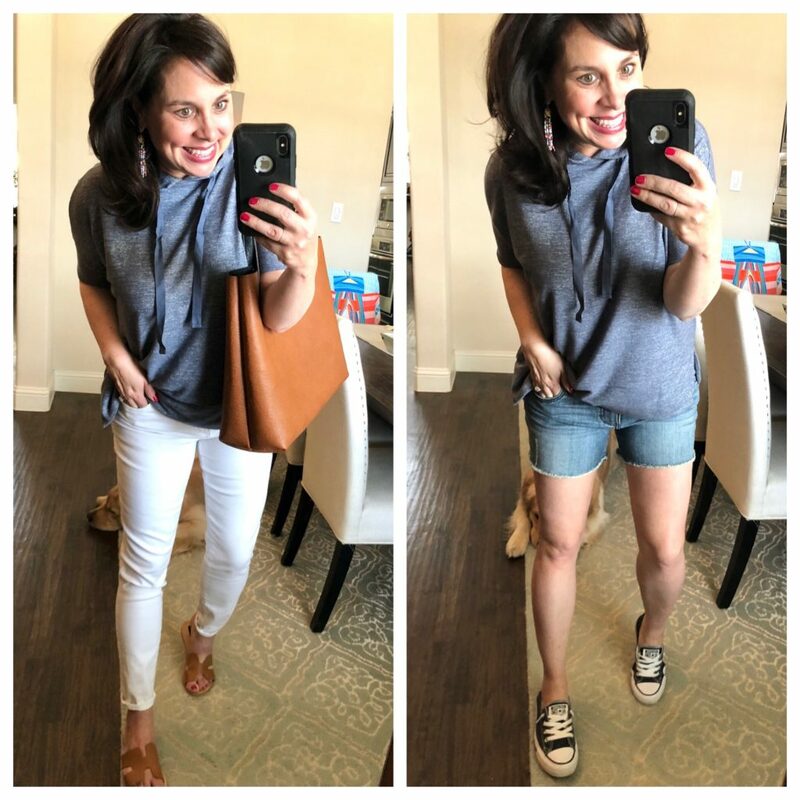 Below you will see a side by side of my two favorite pairs of denim shorts! Do you remember my short sleeve short t-shirt dress from my last post? Well, here’s the sleeveless long version! I think they are both really great closet staples. I’m wearing a small in the dress, so I think it’s true to size. This side slit maxi is AWESOME. But I’m sorry to say it’s not under $22. It is however ONLY $24!!!!! Ha, GOTCHA! It’s CRAZY! Check out the picture on the right to see the cut. I thought it looked great paired with my white denim jacket. Y’all aren’t going to believe this, but the straw circle tote is from Walmart! Isn’t it so cute?!? The handle is wrapped and darling, and if you look at both pics below you will see that one side is plain and the other side is color blocked. Same dress, I just switched out the white denim for my stonewashed denim. And the picture on the right shows you how you can tie up the side slit for a super casual look. This dress would even be great with flip flops as a beach cover up. You could also dress it up with statement earrings and tall wedges. Okay. We’ve made it to the end! 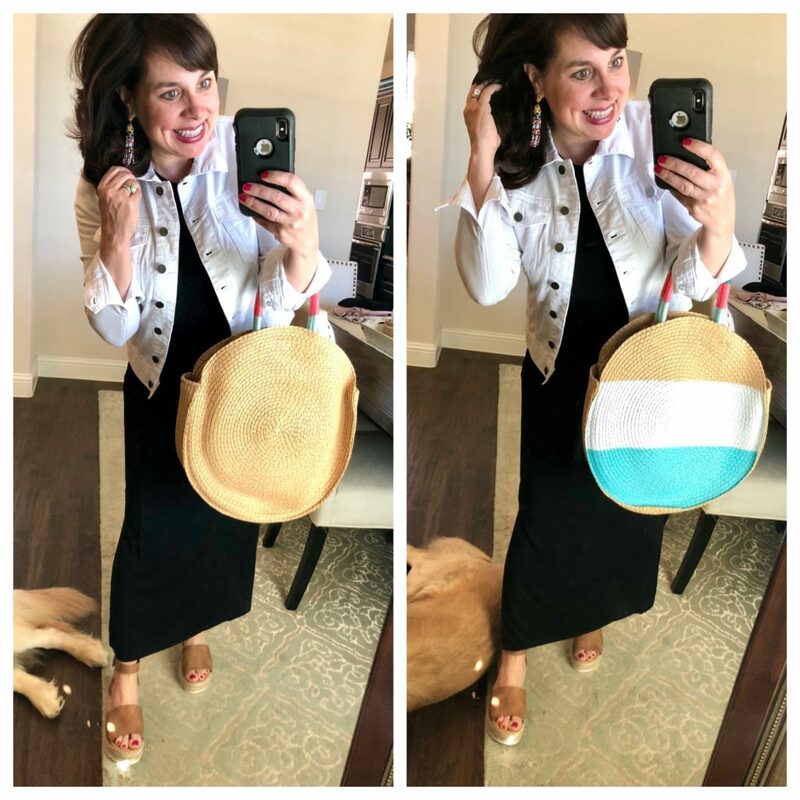 I just wanted to round up the shoes and the earrings that I was wearing in most of the outfits in this post. I highly recommend everything you see! WHEW! That’s all for today! 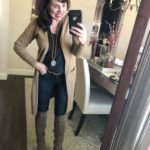 I hope y’all loved reading this post as much as I loved going on my Amazon treasure hunt. I’m consistently amazed at the quality of the products I find AND the awesome prices. And I know y’all know this, but if I don’t personally like the item, I will not put it on the blog. I placed a HUGE order for this post, and 13 pieces didn’t make the cut. So, trust me. If it’s on this post, I like it. And if I really LOVE something, you’ll know that too. I just can’t contain my excitement. I would love for you to leave a comment on this post. Let me know your favorite piece(s) I highlighted today! And if there’s anything specific on Amazon you would like me to check out (a piece or a brand), please leave your request in the comments! Um, you should wear that red dress all the time. Like…every.single.day. Gorgeous! This was a great post! 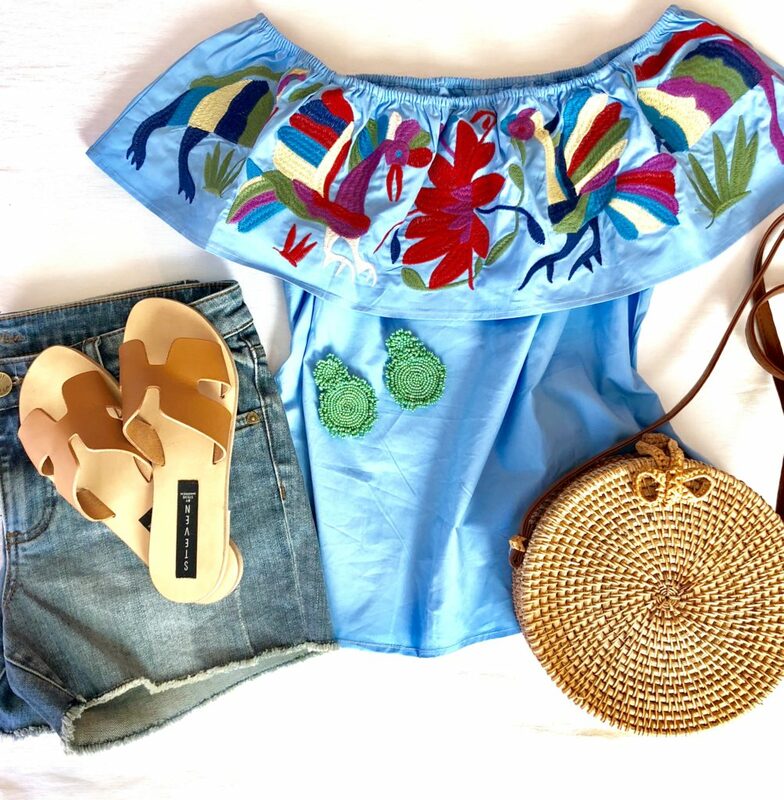 That baby blue embroidered top, absolutely beautiful. 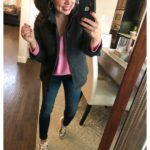 As a tall woman (6’0 to be exact) who loves a cute outfit, I find most tops difficult to wear due to my obvious length. I religiously follow just a handful of bloggers, do you know of any taller bloggers that you could direct me to? Thank you, Sheaffer! For taller bloggers, check out Pinterestingplans.com. I believe she is 5’10”. Veronikasblushing.com is also taller. I would love to know too! I am 6 feet tall and not model thin so I struggle to find things that fit right and don’t make me look like a whale because I needed a bigger size. Pinteresting plans is a great one! She’s 5’11! Pinteresting Plans for sure! And she’s hysterical too! I’ve been looking for a great cover up!! Love this one!! thank you!!!! So many goodies!! Eeekkk!! I love that flutter sleeve dress! Do you have a previous post with all of the bracelets you are wearing in the glasses photo? Great one today….off to place my amazon order! Holy goodness, I loved every single item on this post! Soooooo cute! Help! The low profile wedge link pulls up a different shoe – skinny straps instead of on big one?? Hi, Kathy! Are you on your phone or computer! I’m on a field trip with my son all day and it’s harder to see on the phone, but the link contains lots of different shoe options. Are none of them the wide strap? Thanks, found them! Different colors are different styles… Enjoy the field trip! 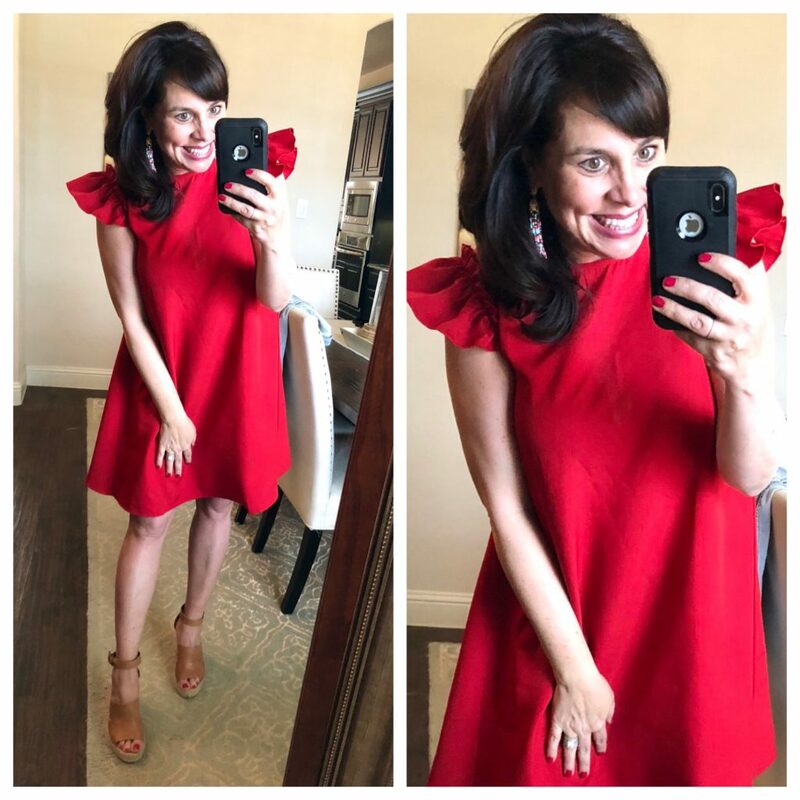 Love the red dress on you! The beaded earrings are fun and the embroidered tops are precious! 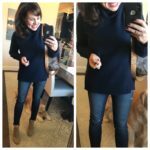 I love that brand (of the two tops) and I have picked up several pieces online and in local boutiques. Hi, Becky! I just checked, and I think mine are actually the “leopard”! These are so great!! Loving these Amazon posts! So many great things! Thanks!! So many cute finds, Sheaffer! And I love that they’re all from Amazon. 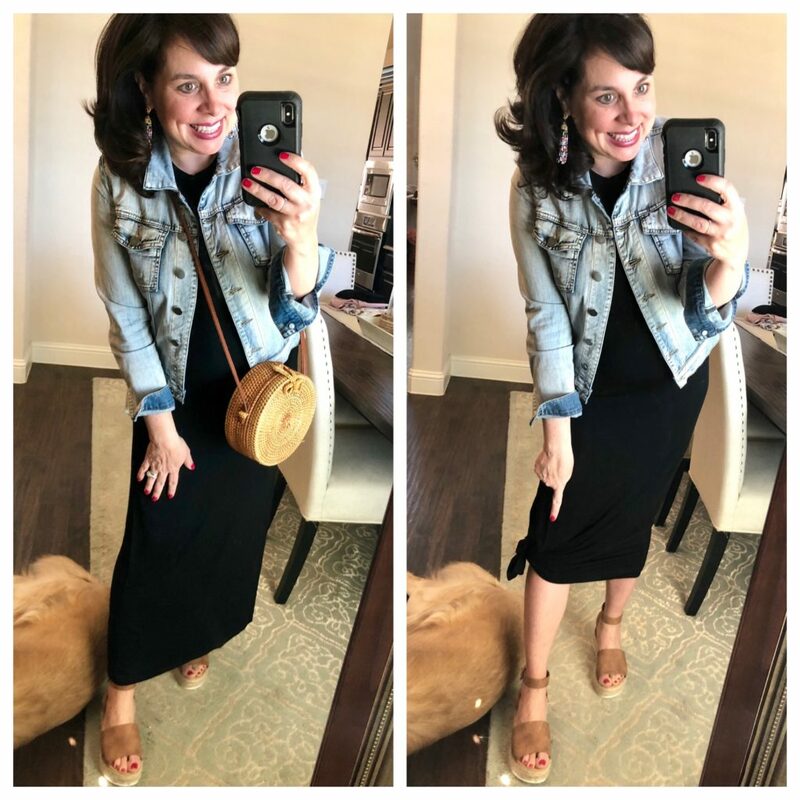 That black maxi dress is so cute and I love that you can tie the ends for a completely different look. Enjoy the field trip! Love this! I was so in need for some spring styles and vacation wear. I would love to see some Amazon recommendations for long necklaces. What color are your wedges? I see 2 that could fit the bill. Dk Nat*t or Taupe Nbpu*tc? I think they are the tan! Too much good stuff!! I’m at work so I can’t shop (much!) online, but I I sure as heck will when I get home tonight!! 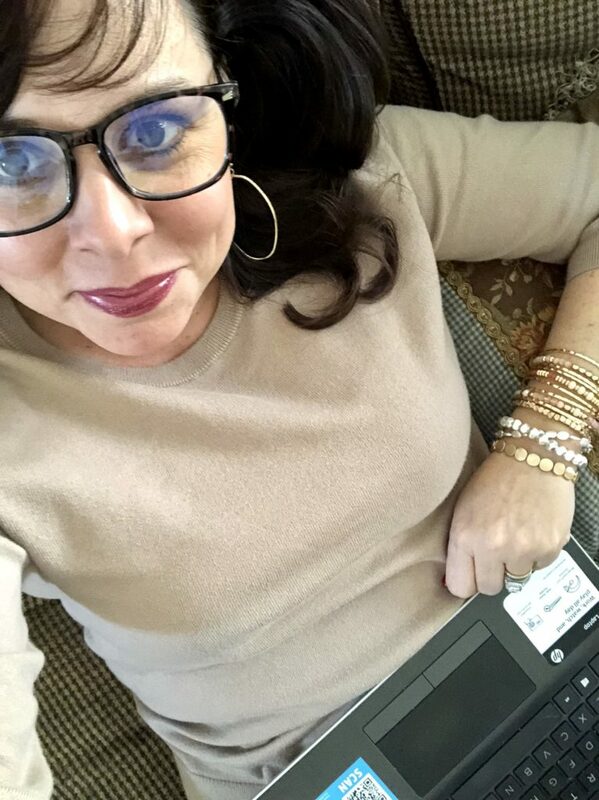 About your arm candy game in the glasses pic?! LOVE! Can you share?! Thank you! You look amazing in red!!! Really amazing! Quick question… I ordered the leopard shirt because there was only 1 left in my size (I took that as a sign! 😉) Love the print, love the fit, but tell me it’s worth $80!? I’m wearing a camo shirt I got from Marshall’s and honestly the quality seems the same. I’m just undecided. Oh Sheaffer you did it again! Love the Amazon post. I had to have the red dress. I love the maxi dress too but it didn’t come in petite. Being 5′ nothing I am afraid it would be too long. So I went to Macy’s website and bought the one featured a few days ago! Bingo!! Keep up the good work. Love everything you style. I am a huge fan of Kut from the Kloth and a huge fan of yours, so I am so glad you are partnering together. 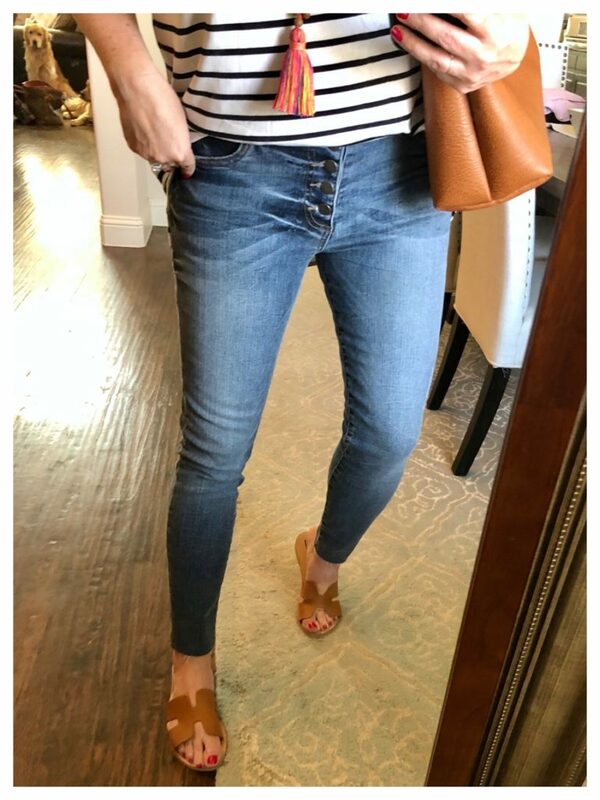 Last year KK had step hem jeans that I failed to get and have been anxiously waiting for their return. Do you know if they will be bringing them back? Can you direct us to the camo leggings you are wearing with the pink sweatshirt? and if they are older or sold out maybe a different brand? Thank you! They aren’t camo! They are blurry stripes! I’ve seen some other bloggers showing some really cute camo leggings from Walmart! Love your Amazon try-ons!!! Everything is great and I love the detail you provide. I adore the low wedges but it looks like they are out of that color 🙁 maybe they will restock soon. Keep up the great work!! This is so helpful and fun to read! The favorite necklace. I just got it and I LOVE the wood beads, I love the knots in between and I am nervous about the tassel. It is neon. Yours comes across more understated. Whelp, I wonder if the colors have changed? Also, love the Steve Madden sandals, but they look very flat without any cushion. Do they hurt your feet? I think the Amazon posts are great fun! Mine is definitely neon if you look closely, but I don’t style it l Me it’s neon! I wear it with everything! The sandals are definitely flat with no support. But comfy for short periods of time or where tons of walking isn’t required! I’ve already ordered the tassel earrings, but now I’m reading reviews that they’re heavy. Thoughts? Hi, Dominique! I don’t think they are heavy at all! That is not a bad price for an embroidered top! The good Mexican tops here (south Texas) sell for $100 each. Will the jumpsuit or the off-the-shoulder top work ON the shoulder as well? Can you show us what that would look like when you take pics wearing them? I may have just added half your post to my amazon cart!!! 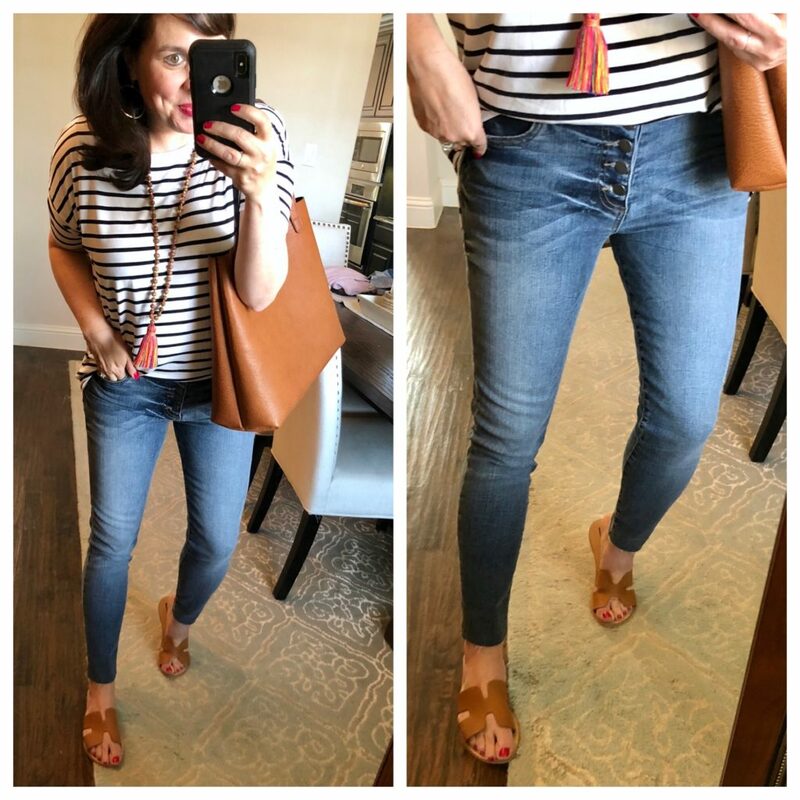 I have and ADORE those button fly jeans, such an amazing fit!! And the sleeveless maxi feels amazing on!!! Is it pretty boxy? I normally wear xs tops so I couldn’t size down. Love the beaded earrings too!! Hi, Kandy! I haven’t tried it that way yet, but I’ll try to show a picture next week! 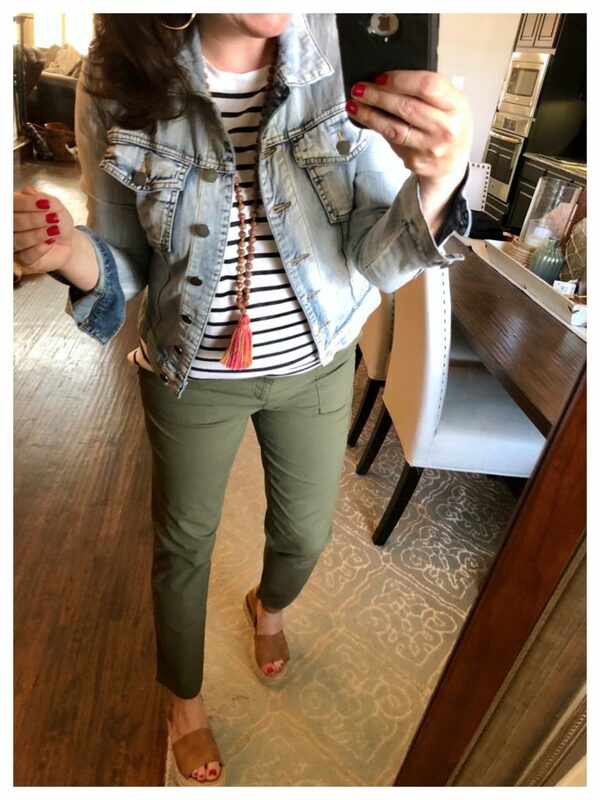 Those olive pants are cute! How is the sizing, and do they stretch out at all? We’re about the same size, so it always helpful when you share what size you’re wearing. Where is the leather embroidered purse strap that’s on the LV bag from? I love the coverup that you have from Amazon. Do you know if that print is still available? I just checked and didn’t see it. It’s awesome! Thanks! How do the white Kut from the Kloth jeans fit? The reviews say TTS, would you agree? What size jean jacket are you wearing? Please let us know when the cover up is back in stock. I love it and want to order it!! Off the shoulder jumpsuit- I ordered this immediatly in the longer length and in olive green. It just arrived and I was so excited…but gosh darn it, it fit so weird. For $20 I was really rooting for this to be a winner and order it in all of the colors, but it was so long around the waist (made my booty look loooonnngggg) and it seemed like the pockets were on backwards. Not flattering at all. Seems like you kind of had the same experience. Wondering if it fits others better. I’m 5’6″ 120. Curious what other girls think. I love all of your posts and appreciate what you do!! Question for you that has nothing to do with your post…any chance you can guide me in the direction of where you got your gorgeous and precious goldens from? Thank you so much in advance for your reponse!